Her eye and interest was drawn to the art of pottery in junior high. Through an inspiring and influential art teacher, who had a ceramics studio, a creative spark was lit that would change Rita’s life. Years later and after exploring many other mediums she returned to clay. Rita is primarily self taught, but studied briefly with a Lubbock based potter who taught critically important techniques of their craft, such as how to throw on the wheel, mix clay and glazes, and set up a show. Rita relocated to Austin in 1997 and began Rita Walker Pottery. A few years later she opened her own studio which was also available to other potters, and additionally began sharing her love of her craft by instructing others. Rita is still intrigued and motivated by the unlimited creative possibilities clay offers. Working mostly with high fired (cone 10) stoneware and porcelain, Rita shapes both functional and sculptural pieces. 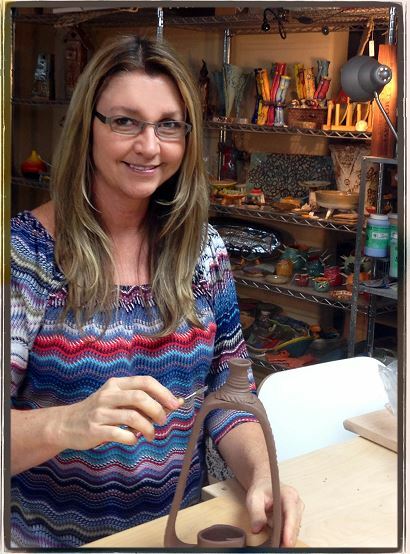 Her passion has not dimmed for the love of teaching, playing and creating with clay.